This is a guest post by Jenny Hunter, Head of Digital, Bureau of Meteorology. Can we have a weather app? This was a consistent cry from the community. 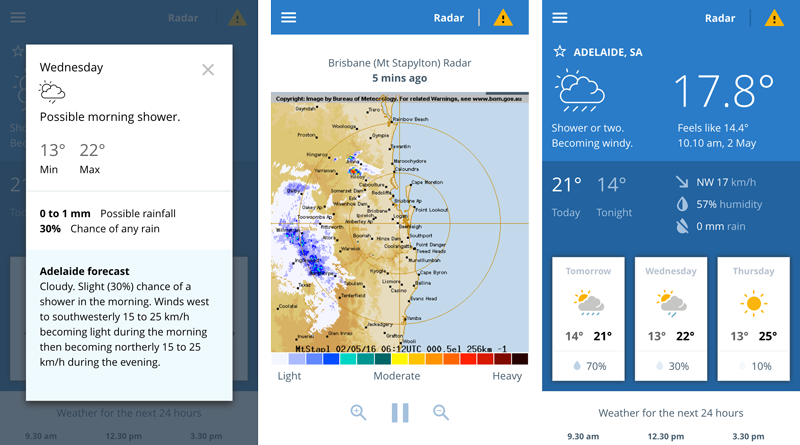 Yet with many other weather apps already available, how would one from BOM be received? Should it be different? Sophisticated or simple? What did our users really want? We were developing the BOM Weather App at the same time the Digital Service Standard (the Standard) was being finalised so we used it as an opportunity to test our process against the Standard’s criteria. As with many projects, there’s the ‘ideal’ way to do things and then there’s the reality – time, resource and funding pressures as well as business requirements. Highlighting the value of the multidisciplinary team. Assembling a full range of expertise to deliver a product quickly meant we had all the decision makers at hand. This included a subject matter expert in weather hazards and forecasts; operations engineers; automation testers; front and back end software developers, user service designers and an agile coach. Guiding the development of KPIs. Encouraging us to take a deeper look at our user discovery process and how we could improve this in future. Identifying a few areas where we needed to do more work including around the app’s accessibility. Some of the weather apps in the market are seriously feature-rich. Rather than attempting this path, we used our existing user research and online services to analyse what information people such as commuters and people planning their weekend use on a regular basis. It may not surprise you to know that it’s quite simple – the radar, the forecasts and the current temperatures. Information to answer questions such as ‘am I likely to get wet?’. Using these insights, we designed a simple app with forecasts, warnings, current observations and radars. People can use their current location or ‘favourite’ multiple locations. It updates every 10 minutes and covers all of Australia, down to 6km x 6km blocks. We tested it with users for usability and usefulness and did some tweaking based on the results of the feedback. It’s absolutely true to say we were nervous about how it would be received. Would ‘simple’ be good enough? As it turned out, we experienced that rare delight of an outpouring of gratitude and many expressions of thanks for keeping it simple. We also got a healthy dose of enthusiastic requests for more features. Launched on 7 October 2016, take up has exceeded expectations with around 400,000 users downloading BOM Weather app in the first month. We received more than 4,000 pieces of feedback with the highest volume through the app feedback form, the app stores and social media. Our next challenge is ensuring we apply the principles in the Standard to future development of the app and across all of our digital services. Having the app as the test case has clearly shown the benefit of this evidence-driven, user needs approach. The principles set out in the Standard support this and enable us to communicate the importance and value of a user-driven approach with our internal staff. We need to do more work to develop our assessment capability and we’ve just hired a Digital Accessibility Officer to guide us on accessibility. And for now we are quickly learning how to manage and address the overwhelming amount of feedback so we can continue to improve on what we’ve already delivered. Jenny Hunter is Head of Digital at the Bureau of Meteorology.